Roof painting can make your roof look new again, adding value to your home. 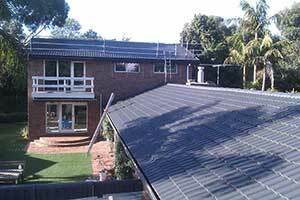 Our business provides excellent Melbourne roof painting service. A service that you won’t regret. We greatly value painting quality which will make your roof look brand new. We always pay attention to detail in order to get amazing and exceptional results. Restoration of your roof can be a daunting task. But do not worry, you can leave the stress to Stormproof Roofing. We are more than willing to work closely with you to discuss a practical variety of options and alternatives that will extend the life and integrity of your roof and make your home look new again. We aim to provide a total roof protection so that you can rely on protecting your family as well as the interior of your house. It is not a good look having your entire house painted and not your roof, which is the most visible part of your house. So roof painting is a good decision because not only does it protect your roof, it also makes your home look better, adding value to your property. So for roof painting, look no further than Stormproof Roofing, and leave the entire roof painting process to us. Call now for a free quote on 03 9585 3744 or email [email protected].